Virginia's Golf Resorts are among the nations best. At the top of this list are The Homestead, Kingsmill and Golden Horseshoe. All three are rich with golf history. The Homestead, located in the Allegheny mountains is not only famous for golf but is also known as one of Americas top family resorts. Kingsmill Resort, Williamsburg VA, is Virginia's largest resort. Kingsmill has hosted 22 PGA tour events and 7 LPGA events on it's Pete Dye designed River course. The Golden Horseshoe Golf Club, also in Williamsburg Virginia, features the Robert Trent Jones designed Gold course which Jones himself called "his finest design.". In 2001, Bay Creek Resort was opened on Virginia's eastern shore. The first resort to have both Nicklaus and Palmer designed golf courses. Other popular resorts in the state of Virginia include Keswick and Wintergreen, both just outside of Charlottesville, Virginia and Landsdowne in Northern Virginia. Williamsburg Golf Resorts, Savvy Golf travelers will notice that two of the most well known golf resorts on the east coast are located in Williamsburg less than fifteen minutes from each other. 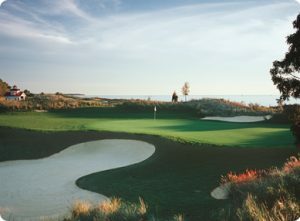 The Golden Horseshoe and Kingsmill Resort are home to two of the "top 100 courses you can play." The Gold and River course have been named multiple times to this prestigious list. Kingsmill's Plantation courses is an Arnold Palmer design and its Woods course was designed by Tom Clark and Curtis Strange. The Golden Horseshoe Green was designed by Rees Jones and borders the Colonial Williamsburg Historic area. Several other great courses are located in the area making Williamsburg a very popular golf destination. In addition to resort accommodations many Williamsburg hotels are just a few minutes from the golf courses, Williamsburg restaurants and attractions. Click below to receive a custom quote from Virginia Golf Vacations within 24 hours.